Oriental Insurance Nagrik Suraksha Policy is a health insurance plan that was designed by Oriental Insurance Company. People of India where between the ages of 5 to 70 years can avail Oriental Insurance Nagrik Suraksha Policy in case of family package. 18 to 70 years can avail for individual or group cover. Oriental Insurance Nagrik Suraksha Policy is a combination of the personal accident insurance and hospitalization insurance policy. Oriental Insurance Nagrik Suraksha policy is available to the citizens of India only. Individual policy including family package. Two types of policies are available. Oriental Insurance Nagrik Suraksha Policy offers Personal Accident cover and reimbursement of Hospitalization Expenses. Personal Accident cover includes Death/Permanent Total Disability, Loss of Limb(s) and Permanent Partial Disability. Under Personal Accident cover, the disability must not be less than 40% in aggregate for becoming entitled to any claim. Under Section – I (Personal Accident cover), Company’s Total Liability in respect of all claims admitted during the policy period shall not exceed the Sum Insured. Under section – II (Hospitalization) Company’s Total Liability in respect of all claims admitted during the policy period shall not exceed the Sum Insured for each completed period of 12 months during the policy period. Discounts: Family Package Discount and Long Term Discount are available under Oriental Insurance Nagrik Suraksha Policy. If there is death then the Oriental Insurance Nagrik Suraksha Policy will cover 100% of the sum insured. For loss of two limbs or two hands or two eyes or one hand and/or one foot and/or eye, 100% of the sum insured will be compensated. For Total Permanent Disablement, 100% of sum insured will be compensated. For 40% of disability in aggregate resulted in bodily injury as assessed by the attending physician then Oriental Insurance Nagrik Suraksha Policy will cover 40% or more than 40% of the total sum insured. For total and irrecoverable loss of the sight of one eye or loss of use of one hand or one foot, 50% of total sum insured will be compensated. During the policy period or during the continuance of Oriental Insurance Nagrik Suraksha Policy by renewal any insured shall sustain any bodily injury resulting solely and directly from accident which would give rise to injury. Up on the advise of a duly qualified physician, policyholder shall require to incur hospitalization expenses for medical treatment at any hospital as an inpatient. In such case, company will Reimburse the amount of such expenses to the insured person. For hospitalization claims the amount will be payable during 12 months/each policy period within the limit of sum insured is a maximum of 20% and during the policy period the unavailable sum will not be carried forward. Compensation under more than one of sub clauses given in inclusions in respect of same injury/disablement. Arising from the insured committing any breach of law with criminal intent. Illness arising directly or indirectly through HIV/AIDS. Death or disablement resulting from Venereal disease or insanity. Death or disability resulting from pregnancy or childbirth, etc. Committing any breach of law of the land with criminal intent. Whilst engaging in Aviation or whilst mounting into, dismounting from or travelling in any aircraft etc. Compensation arising out of War, civil war, revolution, invasion, act of foreign enemies, Nuclear energy, radiation, etc.,. Death or bodily injury arising out of ionising radiation or contamination by radio activity from any source whatsoever. Any bodily injury to the Insured person due to confiscation, requisition or destruction by order of any government, public or local authority is excluded. For more information about Exclusions refer Oriental Insurance Nagrik Suraksha Policy terms and conditions attached below. Cumulative Bonus: You are eligible for Cumulative Bonus (CB) of 5% of sum insured for every claim free year. 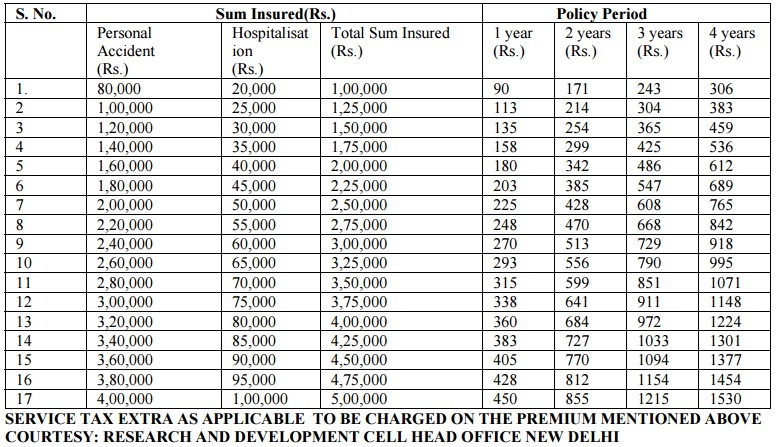 Maximum CB would be 20% of sum insured. Carriage of Dead Body and Funeral Charges: Expenses incurred in the carriage of dead body of the Insured to his/her place of residence and funeral charges shall be reimbursed subject to maximum of 2% of the sum insured,or Rs 2500, whichever is less. Education Fund: In the event of death orPTD (Permanent Total Disablement) of the Insured due to accident, the Policy shall provide compensation towards education fund for the dependent children in addition to the sum Insured. For one dependant child below the age of 23 years on the date of accident, 10% of original Sum Insured subject to maximum of Rs.5,000 is payable. For more than one dependant child below the age of 23 years on the date of accident, 10% of original Sum Insured subject to maximum of.Rs.10,000/- is payable. Loss of Employment: In case of loss of employment due to PTD, 1% of the original sum insured become payable to the Insured Person in addition to the sum insured. This is applicable in case of individual policy holders only. Proposal form/Application form is to be filled. Complete and Accurate information should be given by the Proposer. Proposal form along with address proof, photographs (if required by the Oriental Insurance Company) should be submitted to the company. All the original documents like Discharge certificate/card from the Hospital. Other forms as required by the company. You can calculate the premium using Oriental Insurance Nagrik Suraksha premium calculator. Personal details, Policy period, Number of members, Age and Sum assured and other details are required to calculate the premium. Give me the complete information about Family Package Discount? A discount of 10% on the total premium will be allowed comprising the insured and any one or more of the following members of the insured’s family. Give me the information about Long Term Discount in terms of the policy? Long Term Discount is applicable to Individual Policy only.